Notifications sent from your site to site members are managed in Content > Mail alerts (/admin/notifications/index/). SMTP, short for Simple Mail Transfer Protocol, is used when email is delivered from an email client, such as Outlook Express, to an email server or when email is delivered from one email server to another. SMTP server is responsible for sending your site’s alerts, emails, contact forms, newsletters. Usually hosting companies use default setting for SMTP – localhost, port 25. If that’s the case, leave this section as it is now. Otherwise contact your hosting service provider for the correct info and insert it into corresponding fields. Send a test email to any email address to test if everything is ok. If you receive the test email, it means that your SMTP server works fine and you are all set! You can edit the name of the alert and its default template here. This section is for the mail templates. Edit mail subject and content using different variables. [form_date] – date when “Contact us” form is filled in, and so on. If your server does not allow to send many letters at once you will find your mails queued here. 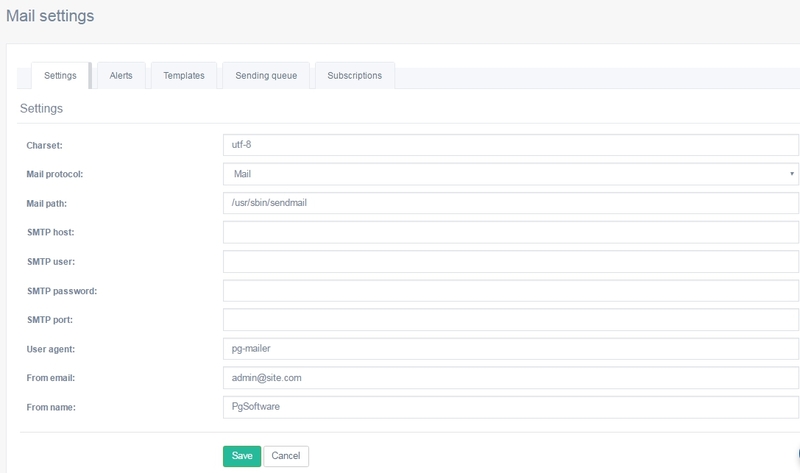 In this section you can create a mass mailing subscription. 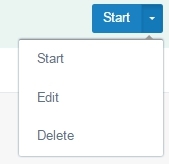 Add name, template (you can create your own in the Templates section), choose subscription type, add a scheduler, set content type – without content. After that you can start mailing, edit or delete subscription.